TIMESSURABAYA, JAKARTA – Enjoying the fresh Es Doger in a very hot day is a bliss. 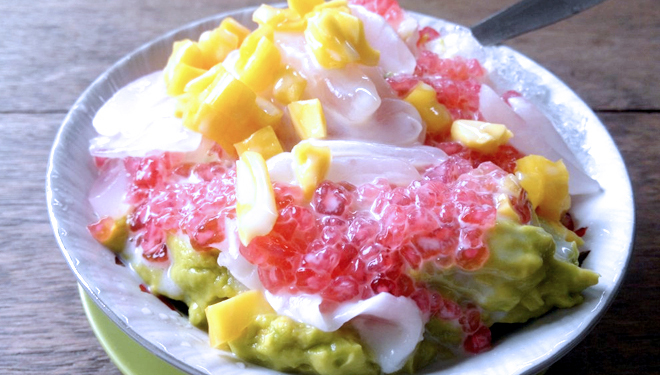 Es Doger is a kind of pink dessert consisting of tape, milk, coconut milk, black sticky rice, and Pacar Cina. The sweet taste of Es Doger could restore our energy and spirit. However, do you know why this dessert is called Es Doger? Initially, the sellers of this dessert should carry a basket containing this dessert in his shoulders. As the time passed by, the heavy basket of this dessert was replaced by a food cart. Since then, the term of ‘Doger’ became legendary as it stood for ‘Dorong Gerobak’ (pushing the cart). Not only the name that changed, but the contents are getting various. Nowadays, Es Doger is added with some fruits, such as avocado, coconut, or jackfruit. However, there are some Es Doger sellers that still sell original Es Doger (without any fruits).